The frescoes in the St Trinity church in Sopocani represent one of the most impressive frescoe works in the Byzantine painting. It is the work of the most gifted painters - amazing use of colours and perfect drawings. The frescoes were painted by 1265 and they are the masterpieces of the classic style with special characteristics of harmony and beauty. The Sopocani ktetor, the King Urosh I erected his endowment according to the style of his ancestors - in the tradition of the old Rashka builders. 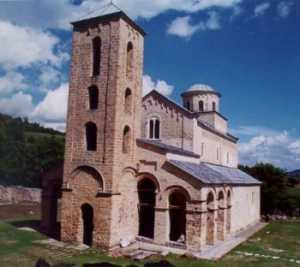 At the beginning of 14th century an outer open nartex with a steeple was added in front of the monastery church.